1) Preheat oven to 150C/gas 1. 2) Line a 23-cm round baking tin with aluminum foil, letting edges of foil extend over sides of pan. Lightly grease the foil. 3) In large bowl, beat the cream cheese at medium speed with an electric mixer until creamy. 4) Add the sugar, beating until smooth. Add eggs, 1 at a time, beating well after each addition. 5) Stir in the sour cream and liqueur. Pour the batter into the prepared tin. Bake for 45 minutes, then turn the the oven off and leave the cheesecake in the oven with the door closed for another hour. 6) Let the cheesecake cool completely in its tin on a wire rack, and then cover and chill for 4 hours. 7) Using the edges of the foil as handles, remove the cheesecake from the oven and peel away the foil. 8) For the chocolate cake, preheat oven to 180c/gas 4. Grease and flour 2 (23-cm) round cake tins. 9) In large bowl, combine cake mix, liqueur, water, oil and eggs. Beat at medium speed with an electric mixer until smooth. Divide batter evenly between the 2 prepared pans and bake 20 minutes, or until a wooden skewer inserted into the centre comes out clean. Leave to cool in the tins for 10 minutes. Turn out onto wire racks and leave to cool completely. 10) For the chocolate almond frosting, beat the butter at medium speed with an electric mixer until creamy. Add chocolate, beating until combined. Beat in almond liqueur and icing sugar until light and fluffy. 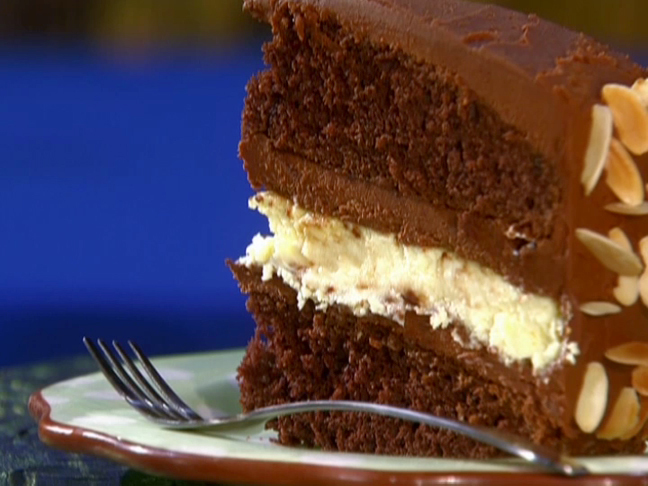 11) To assemble the cake, spread a layer of frosting on top of one chocolate cake. Next, layer cheesecake and top, and then chocolate icing. Place second chocolate cake on top and cover the top and sides with frosting. Sprinkle almonds all over and serve in slices.